As the seventh part of a series to explore the famous roads of cycling, here is the Col de la République in the France’s Massif Central. The idea is to discover the road and its place in the world, whether as part of cycling’s history or to look at the route on a day without racing and it is open to all. The République has a grand name, as if it is the pass of the entire French republic but in fact its origins are more bizarre. Also known as the Grand Bois, it lacks altitude but when it comes to cycling it’s arguably one of the most influential roads in France. It was the first ever high altitude col to be used by the Tour de France in 1903 and is the spiritual home of Paul de Vivie, the man who invented the word cyclotourisme and whose seven commandments of cycling still form the basis of any pre-race team briefing. The D1082 leaves the city of St Etienne to climb straight up to the top. It is 17.8km long at 3.8% and rises to 1161 metres. Don’t be fooled by the D1082 name. France has categories for roads and D means départmentale and normally a quiet road. But look on the Michelin map and this is a red road, a transport artery. This is a main road. It’s fine but if you went with a friend you would not be chatting side-by-side because of the traffic. The start is notable. The road has been redesigned with a large roundabout called the Rondpoint Velocio that is decorated with steel tubing in the shape of a bicycle. Just off to the side is the Paris-Nice, a modest café on the Rue Paul de Vivie. Remember these names. Start climbing and you rise above St Etienne’s industrial legacy. This was once the cradle of the French cycling industry with many top names in the sport. Today only a few live on like Stronglight and Zéfal and the wider decline is noticeable as you pass dilapidated factories. Not all the activity’s gone as trucks rumble past, the gradient already testing their engines as black soot pours out. The road is marked to provide space on the side for the cyclist but this is more a tarmac verge that a cycle path. It’s a steady climb up if there was a race the bunch would be together and the sprinters would be fine but the solo rider can flounder. It’s the most rewarding ascension for the challenge or the view but as you’ll see below it is a special place. The was the first col used in the Tour de France when the race crossed on 5 July 1903. The feat is commemorated with a sign at the top. It’s not the toughest climb but still worth noting. The race did not return until 1950 and the col has been passed 11 times in total with the last passage in 1997. 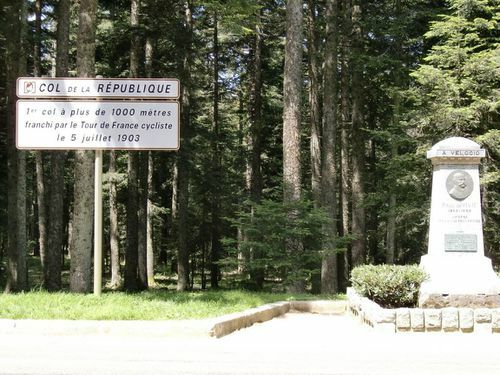 There’s a sign to celebrate the Tour de France at the top but the show is stolen by the memorial to Paul de Vivie, the man often known as Velocio. Remember the Col starts in St Etienne just by the Rondpoint Velocio and the Rue Paul de Vivie and the entire 18km climb is a tribute to him. Who was he? Well take your pick. He’s up there with Tulio Campagnolo and John Dunlop when it comes to bicycle design. He was a sports scientist with ideas on nutrition well ahead of his time. And he invented the word cyclotourisme or cycle-touring. He ran Le Cycliste. He convinced local industrialists to abandon weapons manufacture for bicycle production. First the gears. Velocio is credited with the invention of the derailleur but this a myth. Others had invented this and Velocio experimented with different ideas like two chains before he got hold of a British example called The Whippet and spent time perfecting it on these roads but this was a select technology that was reserved for pure enthusiasts rather than the wider public, like a electronic shifting today. Velocio’s riding pal Joanny Panel took things a step further and produced a bike with derailleur called Le Chemineau (the vagabond) and arguably the first bike that allowed people to tame mountain roads. Perhaps the proximity to these hills and also the booming cycle industry in St Etienne and nearby Lyon meant the ideas took off. Velocio lobbied hard for the derailleur but it was banned in the Tour de France. He reasoned that gearing would assist the riders and put his Le Cycliste magazine to work to help run the Polymultipliée race. Poly and multiplied as in many gears and the race was run over a hilly course designed to show riders with multiple gears would beat those on a single gear. It all makes perfect sense whether you’re training, touring or racing. 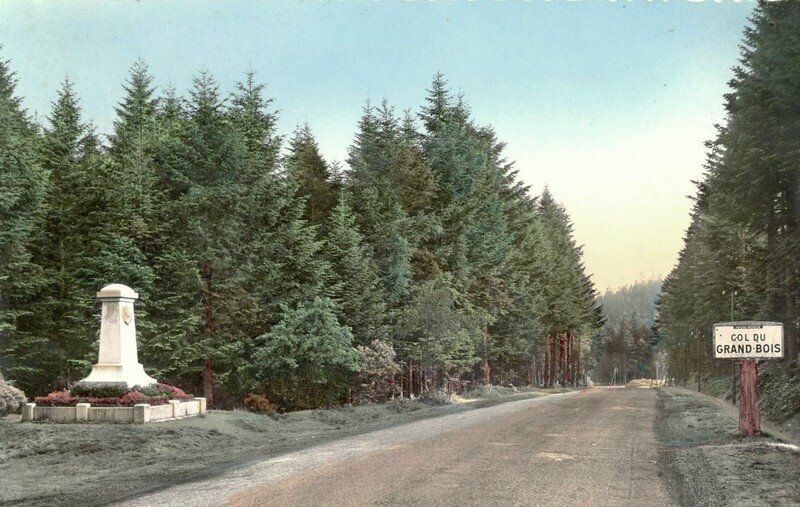 It’s also called the Col du Grand Bois, remember this for the next cycling quiz. Grand Bois means “big woodland” and is the obvious name for the forested flanks of the Mont Pilat hills. The name has been used for many years but has changed with République being more commonly used on maps and signs. The République label is not a grand celebration of France’s political settlement. France had created its republic in the 1789 revolution but a Jesuit sect didn’t want to be part of this and, in a village along the road, they tried to to start The Republic of Jesus Christ in 1794. But whilst the faithful waited for the Prophet Elijah, the police appeared and cleared the area. The city of Lyon with its airport and high speed rail links is not far away and the city of St Etienne is just at the foot f the climb. St Etienne is ok but an industrial sort of place, it’s not a prime pick on the tourist route. But it’s small and a few turns of the cranks sees you in the hills for the day with a big choice of rides nearby. I knew the road but in writing the piece I’ve learned a lot more. This road deserves a lot more fame and not just because it was the first col used by the Tour de France but also as a celebration of Paul de Vivie, a hero of French cycling who is known but rarely celebrated. A most excellent Saturday morning read. Also gave me a reminder to Paul Fournel’s many references to St. Etienne, it’s cycling culture and surrounding roads in his collection of essays Vélo (Rouleur). I did this last year on a touring trip. I thought it would have been fitting to include it in this years 100th tour. Great choice again. These are very enjoyable pieces, a nice break from the constant doping news! I remember this climb from LeTour many years ago, I think the finish was at St. Etienne so we probably came down this way rather than up? I think I was driving a support van that day so can’t even claim to have been there on a bicycle but it was nice to read about it and see the photos. Your next feature will be similar for me – a climb I’ve been up only in a car – we laid out a Dolomites South itinerary years ago but never produced it..but I was happy be up there anyway, especially with the connection to Tullio Campagnolo….the memorial up there is something all Campagnolo fans should see. Wow, Larry! A climb in Italy that I’ve done and you haven’t. I did the Croce d’Aune in the old GF Campagnolo a few years ago. Interesting climb but IR will tell us those details. I love this series Inner Ring. Can you make it 20 climbs instead of 10? Wonderful! You have a rare eye and ear for the little things that make the sport great. Climbs are the spiritual experience of cycling, the part of the sport that we can all attain regardless of ability or age. You may never sprint like Cavendish or be a rouleur like Voigt, and you will probably never climb like charlie Gaul, but you can get to the summit of these climbs in your own time and feel that you have shared their experience and suffering. I only ask as I’m relatively new to cycling. My favourite rides (in my area) all involve good climbs, which I enjy as they are a good test but the routes are generally a more rolling course. Yes and no. I have a few other roads in mind and not all are climbs but they will tie in better with the classics. But the climbs are famous whilst many other stretches of road aren’t. I can’t wait for this one. This series will be a “must have” by the time it’s finished. didn’t know about Paul de Vivie, thanks Inrng. St. Etienne once had a good football team, sadly they’re on the decline too. Nice article. There’s something else special about this col. When you leave St Etienne and go over the top and down into the Rhone valley, you have left the top two thirds of France and entered the South, which is culturally, architecturally and climactically different to the rest. It feels and looks different, an example is the terra cotta roof tiles which become more prolific from here. I believe it has been used in the ‘race to the sun’, Paris-Nice and that’s’ when the arm warmers /winter gear typically come off! Yes, I think it’s also on the point where a raindrop that falls on one side of the col will eventually end up in the Atlantic but on the other side it goes to the Med.